Pietro Stefano Gaspari was apostolic visitor to Albania in 1671-1672, whose job it was, in the Ottoman period, to report on the situation of the Catholic population of northern Albania and neighbouring Montenegro. Islam was spreading swiftly throughout the region and Catholicism was in a sorry state, as he notes on his journey. 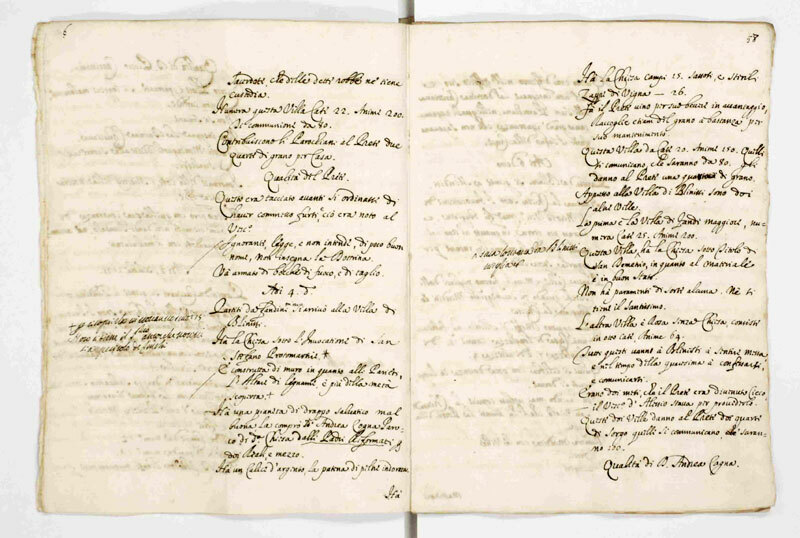 His report to the Vatican, “Relazioni delle Diocesi di Serbia, Pulati, Scutari, Sapa, Alessio, Durazzo e Antivari del 1671,” covers Kosovo, Pult, Shkodra, Sapa, Lezha, Durrës and Bar. The following translation covers the parts of the work devoted to the dioceses of Pult (corresponding to the mountains northeast of Shkodra), Shkodra and Lezha. The original place names of the Italian text are left here with the modern Albanian equivalents, where found, given in square brackets. Some portions of the manuscript are obscure and, as such, the English translation, omitting some passages, may not be entirely accurate. Pullati [Pult] is divided into an upper and a lower part. Upper Pullati begins at the peak of Mount Biscasso [Bishkaz] and borders with the east of Scutari [Shkodra], whereas to the west it extends to the ridge of Mount Agari [Qafa e Agrit] near the village of Sala [Shala]. To the north it borders on Mount Callogero that separates it from the Diocese of Scutari. To the south it extends down to the Drino [Drin] river that divides it from the Diocese of Sappa [Sapa]. Coming from the Diocese of Serbia, I entered this region on the road to Lower Pullati that took me to Gassi [Gash], consisting of 135 Catholic homes and 906 souls. Serving here was the sixty-year-old Don Stefano Giubani who is a mission priest and is provided with a salary of 30 scudi annually. In this town is the Church of Saint Nicholas, built of stone, but the roof is falling in. Thirty scudi would be needed for its repair. The said priest has no home because it collapsed, and for this reason he does not live in this town but in the village of Biaca which is 4 miles from Gasi [Gash]. This church has a silver chalice and mass is said, though at great peril because the goblet is perforated. They say that the chalice has been lost. The said reverend priest takes care of the belongings of the said church. The Eucharist is not held in this church out of fear of the Turks [Muslims]. In Gasi there are two Patres Reformati: Brother Gioseffo of Tuscany, priest, and Brother Angelo of Naples, lay priest and surgeon. A hospice has been built in this village of Gasi that is maintained by the parish […]. Brother Gioseffo does not celebrate mass in the Church of Saint Nicholas, but in the nearby hospice, which is not a very suitable site. He does not have much knowledge of the Albanian language. Father Angelo, on the other hand, goes around and treats the sick people in the villages. On the 23rd, we left Gashi and travelled to Biaca where the above-mentioned Don Stefano Giubani resides, who joined the Reformati Brothers in Gasi as part of the mission. This town has a church dedicated to Saint Veneranda. It was built recently and is materially in good condition. The Eucharist is not held here. In addition, there is another church in this town, dedicated to Saint Catherine. It has stone walls and is in good condition. Both churches are covered in slabs. Neither of these churches has holy vestments. The reverend father also serves in the village of Nicagni [Nikaj], 6 miles from Biaca where there are 35 homes with 300 souls. It was recently pillaged by the Turks, who reduced it to a state of great misery. It has two churches: one dedicated to Saint John the Baptist and the other to Saint Veneranda, both constructed with stone walls and in good condition. But both are devoid of vestments and holy furnishings. Therefore, at great discomfort to himself, the priest has to bring them with him. He also serves in the village of Palci [Palç] that consists of 26 homes with 150 souls. It has no church. He serves, in addition, in the village of Sala and other places listed below. The church here is dedicated to Saint Mary. It was constructed with stone walls and is in good condition. There are 7 homes here, with 80 souls. The village of Curagni [Curraj] is 20 miles from Biaca. It has 3 homes and 50 souls. There is no church. He also serves in the village of Plani that has 100 homes and 70 (?) souls. There is a church here dedicated to Saint George, adorned with various statues and built with stone walls, but it is in a bad state with regard to the material. But the villagers are going to repair it. The village of Bugnani [Bugjon] has no church. It consists of 30 homes and 250 souls. The village of Lesia has 10 homes and 90 souls. It has no church. The village of Castiuichia has 20 homes and 200 souls. It has a church dedicated to Saint Veneranda, built with stone walls and has a wooden roof. The village of Ragnia [Rajë/Breglumë] has 8 Catholic homes and seven (?) souls. It has a church dedicated to Saint Veneranda with stone walls, that is in good condition. The village of Anichiet has a church dedicated to Saint Demetrius, built with stone walls and in good condition. There are 12 homes and 120 souls. All the above-mentioned churches are devoid of vestments and holy furnishings, and the Eucharist is not held in them. The said Don Stefano goes there to celebrate mass and to administer the holy sacrament in accordance with their needs, attending each of the villages at least twice a month, bringing, at great discomfort to himself, the vestments with him. On this side of Mount Agari, as the centre of Upper Pullati, is the village of Sala encompassing 32 homes and 200 souls. These are well-armed and vigorous people, not only physically but also with regard to the site of the aforementioned free town. They continually attack the Turks along their border and almost always return victorious. This village had four churches: Saint Nicholas, Saint George, Saint Stephen and Saint Veneranda, but they have all been razed to the ground. All of Upper Pullati is under the care of Don Francesco Samerissi about whom we will speak further on. The village of Bobi [Bob] has 13 homes and 58 souls. It has two churches, one dedicated to the Assumption and the other to Saint Nicholas. Both of them are built of stone walls and are in a good condition, but without vestments. The village of Saint Elias has 22 homes and 83 souls. It has a church dedicated to Saint Demetrius which has stone walls and is in good condition. The village of Toplana [Toplana] has 22 houses and 120 souls. In this village there are 5 churches: Saint George which is structurally the most beautiful, the church of the Assumption of the Virgin, the Church of Saint Nicholas embellished with various statues that were taken from those in the town, the church of Saint Catherine and the church of Saint Veneranda. All these churches are built of stone walls and are in good condition with regard to materials. The Eucharist is not held here, and they are all without vestments or holy furnishings. The village of Mola has 6 homes and 40 souls. There is a church here dedicated to Saint Henry Bonaventure, built of stone and in good condition. The village of Sosi [Shosh] has 30 homes and 250 souls. There is a church here dedicated to Saint Henry, built of stone and in good condition. The village of Chiri [Kir] has 43 homes and 300 souls. There is a church here dedicated to Saint Veneranda, that was recently restored. The village of Casnessi has 9 homes and 45 souls. There is no church so the inhabitants go to the village of Chiri to attend mass. The village of Bogu (Pog) has 12 homes and 50 souls. There is no church so the inhabitants go to the village of Chiri to attend mass. The village of Mongulla [Mëgulla] has 6 homes and 30 souls. It has no church. The village of Giovanni has 22 homes and 80 souls. There is a church here dedicated to Saint Nicholas, built of stone, covered in slabs, and in good condition. The village of Planti [Plan] has 52 homes and 312 souls. There is a church here dedicated to Saint Anthony the Abbot, built of stone and in good condition. In this village lives Don Francesco Samerissi, parish priest of the said villages. This church is devoid of vestments and thus needs a chasuble, chalice, missal, book of rites and linen cloth for the host. Its chalice is [cracked] at the bottom and can only be used with great difficulty for mass. The said priest takes care of the holy garments. All the other, aforementioned churches in these villages are devoid of vestments and holy furnishings. The priest must therefore bring his own vestments when he celebrates mass in these villages, which he does three to four times a month and is quite exhausting for him because the village is 12 miles away. The village of Buccamira [Bukëmira] and of Daizza [Dajca] has 10 homes and 73 souls. It has no church. The inhabitants go to hear mass at the village of Planti. These villages provide the priest with quantities of grain for his home and four pounds of cheese. The people of Pullati are exceptionally fierce, and are given to marauding and thievery. Great ignorance reigns here for lack of clergymen. They form illegal gangs, and pillage their own relatives. The area is infertile and rocky with meagre harvests of grain. 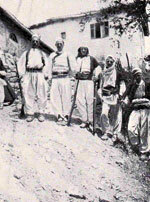 They get most of their supplies from the territory of Jacova [Gjakova] and Prisren [Prizren]. They suffer from a great lack of oil and, as such, few of them bother to keep the Vigils and forty days of fasting over Lent. There are flocks of sheep everywhere and in great numbers. The Turks do not reign over them. There are three parishes in Pullati: in the village of Gassi are the Patres Reformati, in the village of Biaca is Don Stefano Giubani, and in the village of Planti is Don Francesco Samerissi. For the preservation and education of the people of Pullati, who are so ignorant that they know neither the Lord’s Prayer nor the Ave Maria, it would be very useful and profitable to send to them four mission priests, if the Sacred Congregation in its wisdom would deign to agree to this. One mission priest for the region of Nicagni. Two mission priests for the town of Chiri who would alternatively instruct the general population and the children in their capacities both as missionaries and as school teachers. One other mission priest for the village of Planti so that these people, gone so astray from the Lord, may begin, if so exhorted to do so, to hear the word of God and turn away from their errors and produce fruits worthy of penitence. Many of them die without the sacraments for a lack of clergy, and those clergymen who are available are not able to carry out their duties well enough due to the distances from one settlement to the next. In the Diocese of Pullati, there are 581 Catholic homes, with 4045 Catholic souls. There are three parishes: in the village of Gasi, in the village of Biaca, and in the village of Planti. This diocese begins to the east of Mount Agari, at the foot of which is the home of the Bishop of Scutari, Pietro Bogdani, approximately 82 miles from Scutari. It extends along the bank of the Lake of Scutari towards the Archdiocese of Antivari [Bar] that constitutes its western extremity. Going northwards, it begins at a place called Pedana [Bërzana] and, going southwards, it stretches from Pulagni [Pulaj] on the coast of the Adriatic. Above it is the river Drin and it borders on the Diocese of Sappa and the Diocese of Alessio [Lezha]. The Diocese of Scutari is divided into an upper and a lower part. The upper part includes the mountains. The lower part is the flat land. Let us begin with the upper part. Having finished visiting the Diocese of Pullati, I continued down to Riolo [Rrjoll], in the upper part of the Diocese of Scutari. Riolo is situated in the mountains above some hills and is the centre and is equally distant from the villages around Scutari. Riolo has 20 homes and 156 souls. There is a church here dedicated to the Ascension of Our Lord, built at the recently constructed residence of the Bishop of Scutari. The other villages around Riolo that are under its care are: the village of Ciasamarne (?) with 11 homes and 64 souls, the village of Dodeci [Dedaj] with 3 homes and 26 souls, the village of Rieci [Reç] with 25 homes and 163 souls, the village of Racci (?) [Renc?] with 8 homes and 52 souls, and the village of Vorfa [Vorfa] with 3 homes and 15 souls. At that time, the reverend father Clemente of Brindisi, of the Apostolic Mission of the Patres Reformati was serving and assisting the people there. The Eucharist is not held here although there is no threat from the Turks. There are other settlements a bit farther away that are also under the care of Riolo. The village of Loeia [Lohja], 6 miles from Riolo, is the site of the church of Saint Nicholas, that seems to be roofless. There are 20 homes here, and 183 souls. 30 scudi would be needed to repair the church. Needed in this village are a set of vestments and an icon of Saint Nicholas. The village of Scarieli is ten miles from Riolo and has 65 homes and 500 souls. A set of vestments is needed here. There was a church dedicated to Saint Veneranda, but it has collapsed. 50 scudi would be needed for its reconstruction. The village of Zusci (?) is 25 miles from Riolo and has 9 homes and 80 souls. The village of Luchi is 26 miles from Riolo and has 8 homes and 80 souls. The parish priest of Riolo, Father Clemente of Brindisi, apostolic missionary of the Patres Reformati, attends to these villages. He visits them two to three times a month to hold holy mass and administer the holy sacraments. On the 10th, we left Riolo and arrived in the land of Castratti [Kastrati], 18 miles from Riolo. Here there are 75 homes and 660 souls. There is a roofless church here dedicated to Saint Mark. It is in need of repairs that would cost 50 scudi. It also needs a set of vestments. It is under the care of Riolo, but since it is quite a distance away and there is only one parish priest, he cannot pay sufficient attention to the needs of the people there. Most of them die without receiving the sacraments and are buried without cross and candle. Therefore, for the sake of these people, it would be necessary to train two clergymen who could alternatively teach the young people and help those who have abandoned Christianity with the provision of holy garments, chasubles, a chalice, a book of rites, a missal, a covering for the altar, two corporals with the burse, and a ciborium. 30 scudi would be needed for each for them because it is a rocky and infertile country. The jurisdiction of Riolo between the mountains ends here. On the 12th of the month, we left the land of Castratti and arrived at the village of Hotti [Hoti] which is 25 miles from Riolo. It has 130 homes and 700 souls. It has a church dedicated to Saint Veneranda, the roof of which is in need of repair. Cost 30 scudi. There is no priest, but they are under the care of Gruda [Gruda] where the Patres Reformati are stationed, 26 miles from Hotti. Due to the great distance, however, they cannot provide sufficient assistance. Many people die without receiving the Sacraments and are buried without a cross and candle, as I can testify. To care for the needs of those souls, it would be necessary to set up a mission in this place, either with regular priests or secular clergy, which would involve a one-time provision of 30 scudi, and holy furnishings. On the 24th of the month, we left the land of Hotti and reached Clementi [Kelmendi]. There is a church here dedicated to Saint Clement. It is situated in a place called Speia di Clementi. The church was built by the people of Clementi in 1651, when the reverend Patres Reformati entered the country. Father Leone of Cittadella and Brother Angelo of Milan were serving here. It is done in whitewash without mortar, and covered in planks. It was well looked after and is furnished with holy vestments. But the Eucharist is not held here, although there is no danger from the Turks, as there are no such individuals in this place. 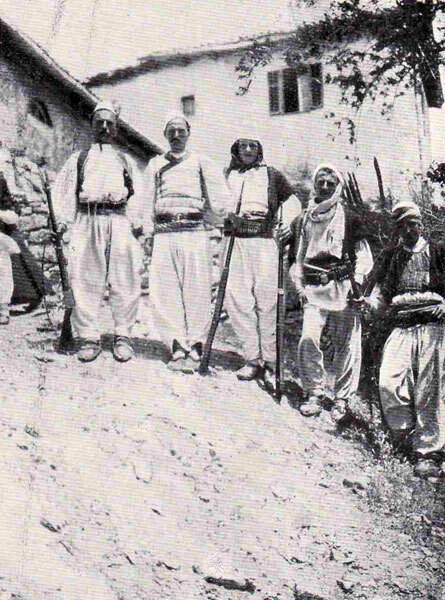 Clementi has a number of villages: Morichi with 6 homes and 40 souls, Genovich with 7 homes and 60 souls, Lesovich with 15 homes and 120 souls, Melossi with 7 homes and 40 souls, Vucli [Vukël] with 32 homes and 200 souls, Rvesti with 6 homes and 30 souls, Zecca with 7 homes and 40 souls, Selza di Clementi [Selca], together with Morichi has 34 homes and 290 souls, and Rabiena and Radenina with 60 homes and 400 souls. All of these villages use the church of San Clemente in Speia. They go there to attend mass and receive the holy sacraments, and when they die, they are buried in this church. The plateau of Clementi and the plateau of Nixi [Nikç] and Roiochi have 112 homes and 660 souls. It is a good 12 miles to Clementi. The Patres Reformati come here two or three times a month to celebrate mass and assist the people in their spiritual needs. There is a need here for vestments because it is very difficult for them to be transported here from Clementi every time. They call it the plateau of Clementi because the Clementi tribe constantly harassed the inhabitants of this area and took over their land. The plateau is fertile and the people of Clementi can make a living off it. Here in Clementi, Father Leone of Cittadella, member of the Reformed Fathers and prefect of the mission, informed me that he needed the following vestments for his mission: Six shirts with amices and tassles, three green and turquoise chasubles, or three in green and turquoise together, three funerary chasubles, three crosses to be placed above the altar, five antichests for the altar, three for Clementi and two for the other missions, and three new missals. Also needed would be a bell with five weights, costing 75 pounds. On the 17th, we left Clementi for Gruda, which is a good two days’ journey from Clementi. In the villages of Triepse [Triesh], Ledina, Cochie [Koçi] and Tusa there are 306 homes. They have large families and number 2500 souls. In Gruda, there is a church dedicated to Saint Martin that is in ruins. It would be good to have it repaired for the numerous people here. Costs 125 scudi, as mentioned in number 88. The people of Gruda constructed a hospice for the Patres Reformati of the Holy Congregation for the mission priests in that place, and have kept it in good condition. There are two such fathers there, both of them priests. The first one is Brother Bartolomeo of Urbino. The second one is Brother Domenico dalle Grotte. The father did not know the Albanian language very well and was ill with a fever […]. He did not use the Christian Doctrine. He had high moral standards and was a good clergyman. The second one knew some Albanian and endeavoured to instruct the people, He also led a good life and had high moral standards. On the 20th, we left Gruda and, in two days of travel, we reached Slavic Grado. It is situated on the plain in the lower part of the Diocese of Scutari. It has recently reconverted from the schismatic faith [Orthodoxy] with the help of the Bishop of Scutari. It has 10 homes and 100 souls. Money would be well used if given for the repair of their little church dedicated to Saint Nicholas, an amount of 40 scudi, and if the church could be embellished with holy rosaries and other holy crosses. Along the banks of Lake Scutari there are scattered some 40 homes and 400 souls. These people, like those of Slavic Grado, are assisted by the parish of Riolo, and under the care of that church. Slavic Grado is in need of vestments. On the 21st, we left Slavic Grado for Upper Trumsi [Trush] situated on the flat land, that has a church dedicated to Saint Sergius, formerly an abbey. The church is large and can hold three thousand people. It is attractive and of an imposing structure, constructed, as far as can be seen from the inscription on the church, by Queen Helen of Dioclea and Serbia in the 13th century. The parish priest here is Don Pietro Trumsi, a mission priest who has been receiving 30 scudi annually. He is 70 years old. I found during my visit that it was extremely badly maintained by the said priest. It had no door and had been turned into a sheep pen and stable for unsightly animals. The Eucharist is not held here out of fear of the Turks. The ruined roof of the building is perilous and for some parts of the walls, one would encounter actual costs of 180. There is nothing left in it because it was taken over by the Turks. There were sufficient holy vestments that were in the keeping of the said Don Pietro. Also under his care was the village called Saint Sergius [Shirq], near the church. It has 30 homes and 200 souls, and is served by Don Pietro Trumsi. Near this village of Saint Sergius is the church of Saint Veneranda under the care of Saint Sergius. It is built of stone and is materially in good condition. It was bereft of holy vestments and garments and for this reason, mass was very seldom held in this church. The Eucharist was not held out of fear of the Turks. He asks his parishioners for a staro [24 litres] of grain, which they give him. They consist of 400 souls. […]. Almost every day, alms are given for the sacrifice of mass. Upper Trumsi is near Lower Trumsi. It uses the church of Saint Sergius. It has 40 homes and 300 souls. The parish priest is Colomsa. The parishioners give him a staro of grain. 120 of them take communion. This church is in need of vestments. It is convenient most often to hold mass in a home when the weather is bad or when the Boiana [Buna] river floods. Near Lower Trumsi is the village of Lagi di Conti, with 60 homes and 400 souls. It uses the church of Saint Sergius. Its parish priest is Don Marco di Niccolò. Those parishioners who take communion, being about 200, give him a staro of grain. On the 23rd we left Lagi di Conti and reached the village of Busagiarpeni. There is a church here dedicated to Saint George. From a material perspective, it is in good condition. The Eucharist is not held here out of fear of the Turks. It has no fixtures because they were all taken by the infidels. It has holy garments which are kept by the priest, but are of little worth as there is need of a chasuble, chalice, missal, book of rites, a ciborium, pallium, two corporals with the burse. The parish priests here are Don Paolo Drami, former student of the College of Fermo, and Don Nicolò Grubena. There are 55 homes and 279 souls. Those who take communion, being about 260, give the parish priest a staro of grain. On the 24th we left the village of Busagiarpeni and carried on to the village of Obbotti [Obot] on the other side of the Boiana, which, together with the village of Sageri, has a total of 28 homes and 350 souls. There is a church here dedicated to Saint Bacchus. It is built of stone. The roof is threatening to cave in and would cost 50 scudi to repair. The Eucharist is not held here out of fear of the Turks. The church does not have any furnishings as everything has been stolen by the Turks. The parish priest here was the apostolic mission priest Don Giovanni Toccati who died two years ago. There is presently no parish priest because the village is very poor and is in no position to maintain one. The parishioners who take communion, being about 100, provide the parish priest with a quarter of grain. The holy furnishings are of little value. A Christian called Mastro Paolo takes care of them. Accordingly, there is a need for a chasuble, chalice, missal, book of rites, linen cloth for the host, two corporals with the burse and ciborium. On the 25th, we left Obbotti and reached Greater Diaci [Dajç], which has 24 homes and 70 souls. It consists of the following villages: the village of Mussandi [Mushan] with 8 homes and 50 souls, the village of Gramsi with 9 homes and 45 souls, and the village of Bellani [Belaj] with 5 homes and 30 souls. There is a church here dedicated to Saint Nicholas. It is built of stone and covered in tiles. The roof is threatening to cave in and would cost 30 scudi to repair. There are no fixtures of any sort whatsoever. The parishioners are extremely poor and contribute very little to the parish, but, for the benefit of these souls, the Holy Congregation maintained a mission priest here, who died. Before arriving in this diocese, the bishop appointed the parish priest Don Pietro Daici, a relative of the dead man. The church was equipped with furnishings and holy garments sent to it by the Congregation. The cup of the chalice was, however, detached from its base. The above-mentioned Don Pietro Daici was serving here. This diocese starts at the border with the diocese of Scutari [Shkodra] […] and extends down to the river Emathia [Mat], to the northern bank. In the west, it begins at the coast of the Adriatic and, stretching southwards, it carries on to the east to the Black Drin which divides it from Serbia. This diocese is divided into an upper and a lower part. The upper part consists of mountains and the lower part of flatland. Thus, setting off from the Diocese of Sappa, we entered that of Alessio by the upper part. In the village of Giunali di Diberri, there is the Church dedicated to Saint George, built with stone walls. It is materially in good condition. The Eucharist is not held here, although there is no danger from the Turks. Don Paolo Gazoli serves here. There is a chasuble and an overlay stole, worked with rough cloth. There are also a chalice and its silver paten, and a missal, all provided by the Holy Congregation of the Propaganda Fide. Don Paolo Gazoli takes care of these items. This village of Giunali and six others: Giesoi, Castanetti [Kashnjet], Somagneti [Zemaj], Freghena [Fregna], Ongari [Ungrej], and Kalori [Kaluer], have 82 homes and 800 souls. The church of Giunali has 26 acres [acre here = 2,900 square metres] of land, but it is infertile and stony. It also owns a 16-row vineyard. In the village of Castanetti, six miles from Giunali, is the Church of Saint Michael, built of stone. It is in good material condition and is roofed in wood. This church is devoid of vestments. The priest goes three times a week to celebrate mass in that church, to the great relief of the local population, but he has great difficulty carrying the vestments with him when he takes them to the church of Giunali. It is therefore necessary that vestments be provided there. Those who take communion, being about 400 in number, provide the priest with a quart of minudi [type of grain or small produce?]. Little wheat is harvested, so the priest goes down to the flatland at harvest time to get his share. This priest is ignorant, as are the others. He can read, but has little education, and does not know how to write. He does not teach the Christian Doctrine, but does not cavort with rogues. He is of good character which is uplifting for the population. Leaving the village of Giunali, we arrived in the village of Cacinari [Kaçinar]. There is a church here dedicated to the Birth of the Madonna. This village has 50 homes and 400 souls. The church is made of stone and is well constructed and, with regard to its material, it is covered in boarding. Its floor is in a bad state. The Eucharist is not held here, although there is a tabernacle and no danger from the Turks. It has two chasubles, one of rough cloth of various colours with an overlay stole and a maniple provided by the Holy Congregation. The other one is of purple silk. It has a silver chalice with a gilded cup. The paten is made of gilded pewter. Don Pietro Stampaneo serves here as parish priest. He takes care of these items. This church has 15 arable fields and a 26-row vineyard. It has a mill and a good number of livestock. Those who take communion, being about 200 in number, give the priest two quarts of grain. He also serves the village of Curta Pulla [Korthpula] that is 12 miles from Cacinari. This village has no church. It has 70 souls, 40 of whom take communion. The priest goes there twice a month to celebrate mass in a private home and more often during Lent for confession and communion. This priest is ignorant. He can barely read and has no education. He does not know how to write. He does not teach the Christian Doctrine. These mountain people are given to raiding and thievery. They are ignorant of the significance and the mysteries of our holy faith. Despite his ignorance, he sets a good example and has not caused any scandals, nor does he cavort with rogues. Leaving Cacinari, we arrived in Fandine minore [Lesser Fan]. This village has a church dedicated to the Birth of the Madonna. It is built of stone. There is an altar set up to Our Lady. The Eucharist is not held here, although there is no danger from the Turks. There is a ragged chasuble of rough cloth, and a chalice with a silver paten. It is in need of a chasuble, a missal, a book of rites and a ciborium. It owns 12 fields and a 10-row vineyard. It is served by Don Theodoro Giansi who was recently ordained as a priest, who takes care of these items. This village has 22 homes and 200 souls. Eighty people take communion. The parishioners provide the priest with two quarts of grain per household. He was accused of having committed thefts before he was ordained, and this was known to the Bishop. He is ignorant. He can read but has no education. He has a bad reputation and does not teach the Doctrine. He goes around bearing a firearm and a knife. Leaving Lower Fan, we arrived at the village of Blinisti [Blinisht]. There is a church here dedicated to Saint Stephen the Protomartyr. The church has stone walls and the altar is made of wood. Over half of the church is uncovered. Fifteen scudi [type of coin] would be needed to complete the roofing. The Eucharist is not held here, although there is no danger from the Turks. There is chasuble of rough cloth that is not in a bad state. It was purchased by Don Andrea Cogna, parish priest of the church of the Patres Riformati, for two and a half reals. It has a silver chalice and a gilded pewter paten. The church owns 15 stony and infertile fields and a 16-row vineyard. The priest makes his own wine, which is good. He also receives enough grain to cover his needs. This village has 20 homes and 150 souls. Those who take communion, about 80 in number, give the priest a quart of grain. Near the village of Blinisti there are two other villages. The first is called Fandi maggiore (Greater Fan) that has 25 homes and 200 souls. This village is about 8 miles from Blinisti and has a church dedicated to Saint Demetrius. It is in good material condition. There are no garments of any sort. The Eucharist is not held here. The other village is Rosa that has no church. It consists of 8 homes and 64 souls. All of these people go to Blinisti to hear mass and, during Lent, for confession and communion. Two months ago, the priest went blind and the Bishop of Alessio now has to provide for him. Those who take communion in these two villages, being about 100, give the priest two quarts of sorghum. He has not been going his job well, and has not been teaching the Christian Doctrine to his parishioners, among whom ignorance reigns and who does not even know how to make the sign of the cross. Leaving Blinisti, we arrived in Miriditi [Mirdita]. 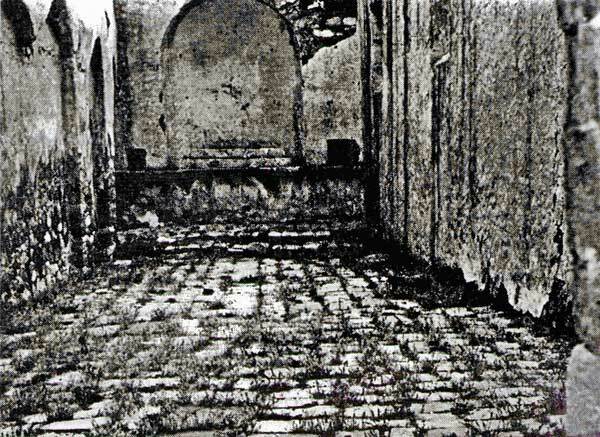 There was a church here dedicated to Saint Nicholas the Bishop, but it was set on fire and torn down by the Turks. The walls themselves still stand and 40 scudi would be needed to reconstruct the roof. The chasuble, chalice and missal were pilfered by the Turks when Mirdita was pillaged and the church burned down. The Bishop of Alessio therefore had a building constructed to be 13 canes long [cane = 2.64 m.], 7 canes wide and 4 canes high. Mass is celebrated here but not under proper conditions as the building is used for sleeping, too. They never managed to cover over the church of Saint Nicholas, that is right in front of the said house. With the villages of Orosci [Orosh], Lageri [Lëgjini], Mastrecori [Mashtërkor], Santa Maria [Shëmria] and Sumerisci, Miriditi has 97 homes and 825 souls. It is served by Don Giovanni Mamesi who was recently ordained as a priest at the residence of the bishop. Don Nicolò Vladagni, who was once a pupil of the College of Fermo, had a school here. In the said villages, there are no churches since they were razed by the Turks. The priest goes there on rare occasions to celebrate mass and, during Lent, he goes there for confession and communion. Those who take communion provide the parish priest with four quarts of grain, that is, in minudi, four pounds of cheese and a secchio [ca. 10-15 litres] of wine. The Church of Saint Nicholas owns a hundred rows of vines that were planted and tended to by the parish priests when they were there. They yield one hundred and twenty tubs of wine per year, depending on the season. They have now been taken over by the bishop. There are ten fields, but they are stony and infertile, and thus produce nothing buy a bit of hay. The priest lives in the house built by the prelate. Four miles from the residence is the Abbey of Saint Alexander the Martyr up in the mountains of Miriditi. This is a titular abbey, not a residence because no one can remember an abbot ever having lived here. The title was held by Don Giovanni Filippi Venetiano. 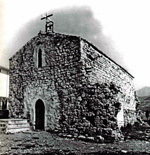 He was followed by Don Paolo Roma Albanese who, while he was in Albania, was not content simply with having the title, but asked the Holy Congregation of the Propaganda Fide in 1663 to be given the parish church of Saint Nicholas of Miriditi. The said Holy Congregation refused, as this was against the wishes of the Bishop of Alessio. This church was destroyed and razed to the ground, and now there is no more church there, though for as long as the people of Miriditi were there, for about the last 180 years, the parish church of Saint Nicholas was served by ordinary priests and not abbots. Of those known are (1) Don Nicolò Cruescionti, (2) Don Gino Orosci, (3) Don Gino Pietrabardi, (4) Don Andrea Regi, (5) Don Nicolò Regi, (6) Don Nicolò Isij, (7) Don Marco Giunti, (8) Don Pietro Ghenati, and currently (9) Don Giovanni Mamesi. This was an abbey of the monks of Saint Basil, who as is custom throughout the orient, are not wont to care for the souls. That this is the case can be seen in the silver casing that encloses the relic of the saint. It is two palms long [palm = 24.9 cm.] and one palm wide. It is adorned with pearls and bas-relief figures and is covered in writing in Greek and in Greek script. If Benedictine monks had made it, they would have covered it in writing in Latin. In addition, when the monks and abbots were living at the church of Saint Alexander, the region where the Mirdites live was not inhabited. When the latter began to live there, founding the parish and accepting parish priests, there were no monks or abbots. Nor is there any memory of them having lived there. But it is known when the Mirdites began to live there, and founded the parish with the Holy Congregation. These titles do nothing but spread contention and discord here between the abbots and bishops, which is not to the benefit of the population. As such, it would be better in the future, for the sake of peace, not to grant them. He was a pupil of the College in Fermo. He achieved little and now neither preaches nor teaches his flock. He taught school in Miriditi. He would fulfil his charge if he were not so often distracted by his uncle, the Bishop of Alessio, who often sent him to Scutari and elsewhere on private business. This was the situation, and he did not obey his prelate, the Bishop of Scutari, but was sent back by the Holy Congregation by means of a letter to his Ordinarius on 21 July 1668 and was ordained as a priest without even showing up, and then went off to his uncle, the Bishop of Alessio, where he now lives. He recently became a priest. He only knows how to read a little and has little education. He does not fulfil his duties, does not teach the Doctrine, goes around bearing a firearm and a knife, incites the Miriditi to rob and plunder, who give the village a share of the booty. Nonetheless his behaviour is not scandalous, and he does not cavort with the Turks or with rogues. We left Miriditi and arrived at Fandi minore [Lesser Fan]. Here there is a church dedicated to Saint Mark the Evangelist. It is built of stone and is in good material condition. The Eucharist is not held here, although there is no particular danger. There is a silver chalice with a gilded cup and a gilded pewter paten. It has a chasuble with an overlay stole and a maniple of various colours provided by the Holy Congregation. Don Primo Trassa serves here. This parish has 60 homes and 350 souls. It has 12 arable fields, but they are infertile and stony so that the priest gets little from them. It has a 25-row vineyard where 25-30 barrels of vine are produced, according to the season. Each household gives him a secchio of wine or two according to their means. As to cereal, they do not give him any wheat because they do not harvest any. Each household gives him two quarts of rye or of red sorghum. He is crippled in both his hands. He was ordained as a priest by Monsignor Benedetto Orsino. He does not teach the Doctrine. His people are not of good morals, like the Miriditi and, what is more, he encourages them to rob and pillage, keeping a part for himself, which they give him. From Fandi minore we went to Montenegro or Stana. The parish priest is Don Paolo Gionema. There was a church here dedicated to Saint James, but it has collapsed. A wooden altar was constructed on the site. It has a ragged chasuble and a little chalice and paten. The new chasuble with an overlay stole and a maniple were provided by the Holy Congregation eight years ago, but the bishop never handed them over. They were then stolen in a raid by the Turks. The priest lives in the village of Stana where there are 50 homes and 400 souls, with 36 of these homes and 250 of the inhabitants being Catholic. The rest abjured their faith some 25 years ago. The village of Spossi [Spas] has 40 homes and 324 souls, but of these, only 8 homes and 40 souls are Catholic. The rest abjured their faith 18 years ago. The village of Pista [Pista] has 35 homes and 300 souls, but of these, only 7 homes and 35 souls are Catholic. The rest abjured their faith 20 years ago. The village of Santa Maria [Shëmria] has 38 homes and 308 souls, but of these, only 10 homes and 40 souls are Catholic. The rest abjured their faith 28 years ago. The village of Santa Croce has 20 homes and 124 souls, but of these, only 7 homes and 30 souls are Catholic. The village of Calimossi [Kalimash] has 44 homes and 300 souls, but of these, only 8 homes and 50 souls are Catholic. The village of Colessi [Kolesjan?] has 60 homes and 500 souls, but of these, only 9 homes and 60 souls are Catholic. The village of Mamesi [Mamëz] has 24 homes and 150 souls, but of these, only 4 homes and 28 souls are Catholic. Aside from the above-mentioned villages, there are four others under the care of the same priest that abjured their faith 20 years ago. None of these villages has a church as they were all destroyed by the Turks. The priest goes from village to village to celebrate mass, two or three times a month. He gives communion once a year, sometimes during Lent, sometimes over Easter. 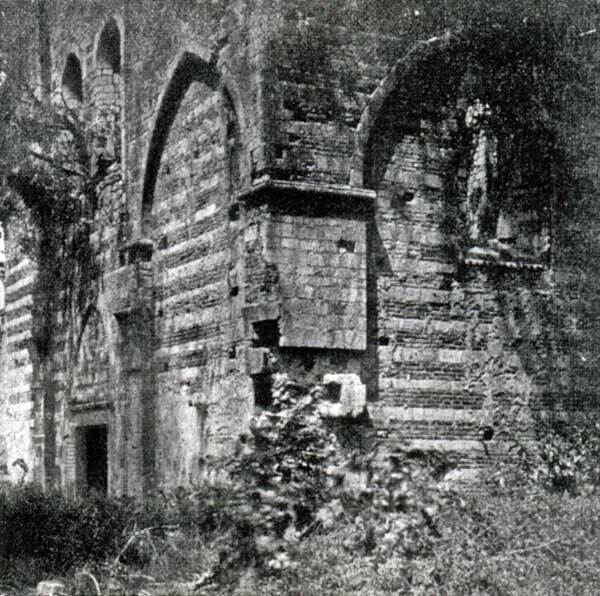 The people gather mostly in the ruins of the church of Saint James. The priest has four arable fields that are infertile and stony, on which he can harvest 2 mozze [measurement] of wheat a year. He also has a vineyard which provides him with 20-25 tubs of grape, according to the season. The parishioners also give him some wine and grain per household. They give him a secchio and a half, or two, of wine and two quarts of grain per household. This priest is ignorant, he can barely read. He has no education and cannot write. He neglects his duties and does not teach the Christian Doctrine to his parishioners. He is given to wheeling and dealing in merchandise and to administering the last rites for a payment of twelve lire. He refuses to administer the sacrament to those who live far away unless he is paid for his trouble. The village of Calameti [Kallmet] has a church dedicated to Saint Euphemia. It is constructed of stone, but the façade is on the verge of collapsing so it is in need of repair. Fifty scudi would be needed. It also needs a chasuble and overlay stole, a maniple, a chalice, a missal and book of rites, and a ciborium. Don Giorgio Murichi serves here as the parish priest. There are 35 Catholic homes with 350 souls. The Eucharist is not held in this church and there is danger from the Turks. The church possesses 30 arable fields, half of which it leases out for farming. They harvest 7 or 8 mozze of grain. There is a vineyard here planted by his predecessors that has been expanded by him, and he now has the advantage of the wine. The parishioners give him two quarts of grain per household. He is of unsound character. He neglects to teach the Christian Doctrine to his parishioners. He used to live a licentious life with a woman, who is now dead. He has now changed his ways and sets a good example. He can read a little but has little education. He is not on good terms with the Turks. Having left Calameti, we arrived at the village of Baladreno [Balldren] that is situated on the banks of the Drin River near Alessio. There is a church here dedicated to Saint Veneranda that was built of stone in a vault form. Materially, it is in good condition. The Eucharist is not held here. There is a belfry with a bell of modest size. The church has two silk chasubles, one red and the other purple, that are in good condition. It has a silver cross. It needs a chalice, a missal and book of rites. Don Luca Spitti, a native of the region, serves here. He was a mission priest for three years and is provided with an annual stipend of 25 scudi. […] The church has 24 arable fields. […] 20 rubbi [rubbio = 9 kg.] of wheat, and as many of minudi. There are no vineyards. There are 33 Catholic homes with 220 souls. The parishioners contribute two quarts of grain per household. He is extremely greedy for money. He lived in Venice for 28 years. He has enough money and a stable income. He knows how to read and write with competence. He neglects to teach the Christian Doctrine to his parishioners. He possesses texts for baptisms, marriages and funerals. He is of good spirits and character, and does not associate with the evil doings of rogues. The parishioners are not too fond of him because of his greediness. He receives alms almost every day from mass. He does not bear arms. Having left Baladreno, we arrived at the village of Cacarichi [Kakarriq]. There is a church here dedicated to Saint Nicholas the Bishop that has stone walls in vault form. Materially, it is in good condition, but the Eucharist is not held here. The chasuble here is not in good condition. The church received a chalice recently from the Holy Congregation, and there is a new missal. It needs a good chasuble. It has three acres of arable fields, and a 15-row vineyard that the priest makes use of for his wine. There are 30 Catholic homes and 230 souls. They give the priest two quarts of wheat, and two of millet or rye per household, and almost every day, he gets alms from mass. Don Michele Cruta serves here. He is unfit and neglects to teach and instruct the parishioners in the Christian Doctrine. He is of decent behaviour. He has on good terms with his neighbours and his parishioners. He goes about armed with a firearm and a knife. Having left Cacarichi, we arrived at the village of Renasi [Rrenc] that is situated near the Adriatic Sea. There is a parish church here dedicated to the Nativity of Saint John the Baptist. Materially, it is on the verge of collapse, and 60 scudi would be needed. The Eucharist is not held here. There is another oratory dedicated to the Assumption of the Virgin. It is in a good material condition. Don Giorgio Gnegi serves here as the parish priest. The priest has no home of his own, and was living, rather disgracefully, in the church. He was given a warning that he was no longer to live in the church. This village is extremely poor, and the priest is forced to beg if he wants to live. It has a chasuble and an overlay stole, worked with rough cloth, and a maniple that were provided by the Holy Congregation, as were the silver chalice and paten. There are 20 Catholic homes here and 150 souls. Those who take communion, being about 80 in number, give him two quarts of grain. The church has no fixed assets. He neglects his duties and is unfit to teach the Christian Doctrine. He often leaves the parish without mass to go begging. He goes about armed with a firearm. The Cathedral of Alessio was formerly the Church of Saint Nicholas the Bishop that was converted into a mosque. Mass is celebrated in an oratory that was built by an ordinary priest and is dedicated to the Virgin Mary. It is situated in the town, has been furnished and is managed by the Brotherhood. It has two gilded silver crosses that are made of wood inside. It has six chasubles of various colours. There are two silver chalices with patens, and two linen cloths for the host. It is currently served by Don Pietro Perlati, a student. In the town of Alessio, there are 40 Catholic homes with about 350 souls. Before Don Pietro Perlati arrived there, it was served by the Franciscan Observants from the other side of the Drin River, Brother Andrea Trassi and Brother Agostino de Nigris. These two fathers are from a monastery of theirs the other side of the Drin River. They have a church dedicated to the Annunciation that is well equipped with holy vestments and furnishings. Brother Agostino leads a scandalous and licentious life. What is more, he sleeps at the Convent. He has lowly habits and, aside from this, is unruly and disobedient to his superiors. When he goes against the wishes of his superiors, he is backed up by the Turks in Alessio. He has little education and is smelly. He has fought to the blood with his companion Brother Andrea Trassi, of whom nothing need be said here. Having left Alessio, we arrived at the village of Merchigna [Mërqia]. There is a church here called the Beheading of Saint John, built of stone walls. Its walls and portico are in a bad state, and 30 scudi would be needed. The Eucharist is not held here out of fear of the Turks. The mission priest Don Pietro Negri serves here who is provided with a stipend of 25 scudi. There are three silk chasubles, the first one being red, the second one being white and the third one being violet, all three of them are used. There is a silver chalice and paten. The priest claims that the new Missal with the portrait of the saint on it was given to him by the bishop. According to the priest, the pallium of the side altar was sold by the bishop for 30 paoli [silver coins]. A gilded tin monstrance is used to expose the Host. There is a tin tombolo with two bells. All of these items are in the care of the priest. The church has 20 arable fields that are subject to flooding and therefore little wheat is harvested. When the season is favourable, more or less ten mozze of minudi can be reaped. It also has a 25-row vineyard and 30 olive trees. It needs a ciborium. There are 80 Catholic homes and 500 souls. Those who take communion, being about 300 in number, provide the priest with two quarts of grain. This priest carries out his duties well and instructs the people. As far as I could observe, he has not given rise to scandal, keeps his distance from the Turks and rogues, and for this reason, he was given a rise of five scudi. Having left Merchigna, we arrived at the village of Zuppa. There is a church here dedicated to the Ascension of Our Lord. Materially speaking, it is in good condition. The Eucharist is not held here for fear of the Turks. There are three chasubles, only one of which, supplied by the Holy Congregation, is in good condition, and an overlay stole, a maniple, a silver chalice and paten, a missal and burse for the corporal. Don Paolo Materisci serves here. The church has a 15-row vineyard from which the priest derives his wine for own consumption. It has four arable fields but they are rocky and infertile. It has a mill that functions only in the winter. In Zuppa there are 25 Catholic homes and 250 souls. Those who take communion, about 100 in number, provide the priest with two quarts of grain. The priest takes care of the holy vestments. Don Paolo Matterisci neglects to instruct the people in the Christian Doctrine. He goes about armed with a firearm and a knife. He has been accused of thievery, and associates with rogues. His parishioners do not like him very much. Having left Zuppa, we arrived at the village of Molini. There is a church here dedicated to Saint Blasius. As to its material condition, some of the walls are on the verge of collapse and would require 20 scudi. It has a chasuble and overlay stole and a maniple. There is a silver chalice and paten and a new missal, all of which were supplied by the Holy Congregation. The Eucharist is not held here. Of the above-mentioned valuables, the bishop erroneously took 30 paoli. Don Antonio Teodori serves here, who takes care of the above-mentioned items. The church has a mill that functions in winter and summer and from which the priest derives his bread. There is a 25-row vineyard that produces copious amounts of wine. There are six arable fields but they are rocky and infertile. This village has 42 homes and 320 souls. They provide the priest with three quartarole [gold coins] of grain per household, partially in wheat and partially in minudi. This priest is of excellent character. Having left Molini, we arrived at the village of Trissi [Tresh]. There is no church here. There used to be one dedicated to Saint Demetrius and the priest celebrates mass in the open air on the site where the church once stood. There is a chasuble and overlay stole, a silver chalice and paten. There is a missal and a book of rites that were supplied by the Holy Congregation. The aforementioned valuables are in the keep of the parish priest, Don Paolo Lalemi, who is a mission priest with an annual stipend of 25 scudi. 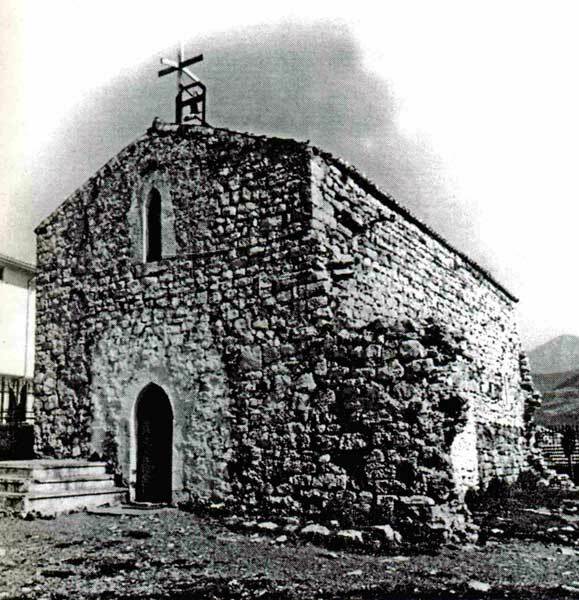 The one-time church of Saint Demetrius has seven arable fields in the mountains, but they are rocky and infertile and produce one mozzo of wheat. There are no vineyards. This village has 26 homes and 240 souls. Those who take communion, being about 120 in number, provide the priest with one quart of minudi. I can only say good of this reverend father. Continuing from the village of Trissi, we arrived at the village of Bogiani. There is a church here dedicated to Saint Alexius the Confessor situated on a lofty mountain peak. It is built of stone, but the roof is in ruins and on the verge of collapse. Material was assembled to repair it and I believe that it has been repaired. The Eucharist is not held here because there is danger from the Turks. It has two chasubles with overlay stoles and maniple. One is green and the other is of various colours. Both are in good condition. There is a silver chalice with a paten made of gilded pewter. There is a crack in the base of the chalice which was plugged by the priest with the help of wax. As such, mass can be held with a certain peril, but it is forbidden as it should not be held with such a chalice. Thus, there is need for a new chalice and a missal. Don Andrea Recci serves here. The said priest takes care of the holy vestments. The church has 12 acres of land but it is in the infertile mountains and the priest derives very little from it. He lets others cultivate it. There is a 30-row vineyard that produces 30 barrels of wine, more or less, depending on the season. This village has 20 homes and 120 souls. They give the priest two quarts of grain per household, and two pounds of cheese. This reverend father has given me cause to suspect that he invited a fellow and his garish wife to his home, as they were in his home when I first arrived. I made sure that he sent them away, as he did. He neglects to teach his parishioners and goes about armed with a firearm and a knife. Continuing from the village of Bogiani, we arrived at the village of Zoimeni [Zejmen]. There is a church here dedicated to Saint Nicholas the Bishop. It is in good material condition and is built of stone. The church has two silver chalices with patens. There is also another pewter chalice with a gilded paten. It has a red pallium made of rough cloth that was provided by the Holy Congregation. There is a new half-woollen chasuble of various colours with an overlay stole and maniple, as well as a gilded silver cross. Don Zuane Uchasi, also known as Trumpsi, takes care of the holy vestments. The church has 30 well-cultivated fields which the priest leases out to others. Depending on the season, they produce between 20 and 26 mozze of grain of wheat and minudi. It has a 31-row vineyard that produces 80, and sometimes 100 barrels of wine. There are 30 olive trees and 30 beehives. He was a mission priest for a three-year period. This village has 50 homes and 400 souls. They give the priest two quarts of wheat and two of millet per household. The church needs a missal and a ciborium. He has no defect other than refusing to teach the Christian Doctrine to his parishioners. He is greedy for money. The village of Pedana [Bërzana] has a church dedicated to Saint Barbara. It is in good material condition. It was restored in 1669 by the Reverend Father Don Paolo Bizza. It is built of stone. It has a many-coloured chasuble that is frayed and in bad shape. The Holy Congregation provided it with a missal. It has a silver cross. The linen cloth for the host, of various colours, was provided by the Holy Congregation. This village has 80 Catholic homes and 450 souls. It has a 25-row vineyard and 30 olive trees. Those who take communion, about 200 individuals, give the priest two quarts of wheat and two of minudi. The church needs a chasuble and a chalice. This reverend father fulfils his functions as a parish priest. In the Diocese of Alessio there are 917 Catholic homes and 7,025 souls. This priest, instead of being submissive to the Turks, treats them harshly and was almost forced to flee, to the detriment of his flock. He enjoys the benefit of 30 fields belonging to the Cathedral of Saint Nicholas of Alessio, now converted into a mosque. He does not have good relations with the Bishop of Scutari, nor does the latter with him because of his obstinacy. He ordained Don Nicolò Vladagni as a sub-deacon and deacon, and as a presbyter he ordained the priest of Durazzo who is subordinate to the Bishop of Scutari, without his dimissory letters. When the Bishop of Scutari suspended his subordinate, Don Antonio Vladagni, for having, in the Turkish manner, married a concubine that he was keeping, that is, he had been given licence to keep her in exchange for a payment, he […] as it appears in the warning issued to him on 5 April 1660, and this is the main reason for their lack of good relations.